Reference: Stephen Moore, ‘The Weekend Interview with Charles Koch: Private Enterprise’, Wall Street Journal, 6 May 2006, p. A8. The billionaire Koch brothers have played a major role in mobilising business in the US to promote conservative causes. They have "invested tens of millions of dollars into free-market think-tanks and political activist groups" and sponsor "a twice-yearly conference that gathers together many of the most successful American entrepreneurs... The objective is to encourage these captains of industry to help fund free-market groups devoted to protecting the fragile infrastructure of liberty". Reference: Stephen Moore, ‘The Weekend Interview with Charles Koch: Private Enterprise’, Wall Street Journal, 6 May 2006, p. A8; ‘ALEC Exposed: The Koch Connection’, The Nation, 12 July 2011. Charles Koch claims to have been influenced by the neoclassical economists F. A. Hayek and Ludwig von Mises and the founder of the Foundation for Economic Education (claimed to be the first modern free market think tank in the US), Leonard Reed. He co-founded the libertarian think tank, the Cato Institute (originally named the Charles Koch Foundation) and is a member of the Mont Pelerin Society. Reference: Lee Fang, ‘MEMO: Health Insurance, Banking, Oil Industries Met With Koch, Chamber, Glenn Beck To Plot 2010 Election’, Think Progress, 20 October 2010. "While the Koch brothers — each worth over $21.5 billion — have certainly underwritten much of the right, their hidden coordination with other big business money has gone largely unnoticed." At our most recent meeting in Aspen, our group heard planst to activate citizens against the threate of government over-spending and to change the blance of power in Congress this November. In response, participants committed to an unprecedented level of support...The meetings are closed to the public including media. Attendees at the meetings include "the titans of industry — from health insurance companies, oil executives, Wall Street investors, and real estate tycoons" as well as hand-picked journalists and think tank fellows. Reference: Dave Gilson, ‘Charts: How Much Have the Kochs Spent on the 2012 Election?’, Mother Jones, 5 November 2012. In the 2012 elections, the Charles and David Koch and their companies contributed over $2 million directly, 95% going to Republican candidates, but they channelled much more to the Republican Party through "outside-spending groups that don't have to disclose their donors", particularly Americans for Prosperity (AFP) a non-profit foundation founded by David Koch that funded anti-Obama television ads in the lead up to the election. AFP disclosed that is spent $36.7 million. Charles and David Koch in fact pledged $60 million to defeat Obama. 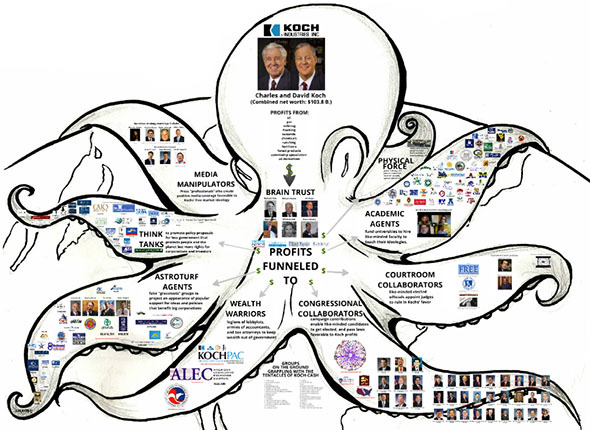 Source: Joe Romm, 'The tentacles of the Kochtopus: What you need to know about the financiers of the Radical Right', Think Progress, 4 April 2011. Reference: ‘ALEC Exposed: The Koch Connection’, The Nation, 12 July 2011. The Kochs are also a major financial supporter of the American Legislative Exchange Council (ALEC), a policy group that enables corporations to shape government legislation to suit their vested interests. 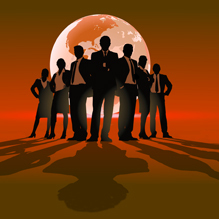 ALEC "gives the Kochs a way to make their brand of free-market fundamentalism legally binding". Several Koch foundation interns have become ALEC personnel or directed its taskforces. ALEC and the Kochs often pursue parallel tracks. Just as ALEC "educates" legislators, Koch funding has helped "tutor" hundreds of judges with all-expenses-paid junkets at fancy resorts, where they learn about the "free market" impact of their rulings. But ALEC also operates like an arm of the Koch agenda, circulating bills that make their vision of the world concrete. Source: 'IFG's KOCHTOPUS: The Kochs' Influence Network explained by Victor Menotti of the IFG', 22 June 2012. A list of some of the think tanks and front groups funded by the Koch brothers and their foundations are shown here. A diagram showing Koch's tea party connections and funding is shown here. Reference: ‘Koch Industries: Secretly Funding the Climate Denial Machine’. Washington, DC: Greenpeace USA, March 2010, p. 14 ; 'Toxic 100 Air Polluters', Political Economy Research Institute, March 2010. 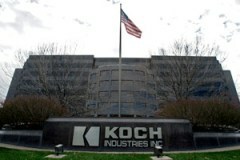 Koch Industries is one of the largest privately-owned companies in the US (and indeed the world) and incorporates over twenty smaller companies covering oil, gas, coal, chemicals, ranching and forestry operations and products. It employs 70,000 people in over 60 countries and has revenues of some $100 billion. In 2010 it ranked number ten of the US top toxic air polluters. 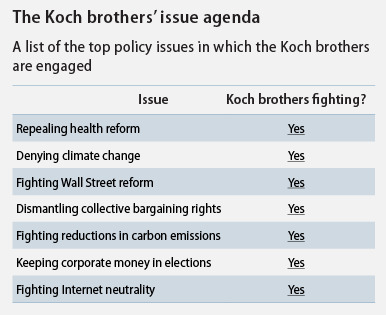 Reference: ‘The Koch Brothers’, The International Forum on Globalization (IFG), 2012. 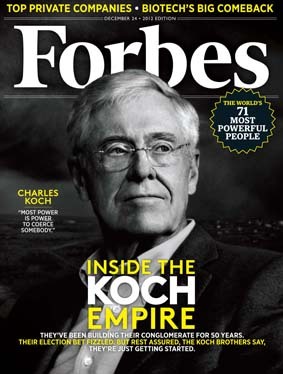 Koch Industries is run by Charles G Koch, who is its CEO and David Koch, who is its Executive Vice-President. Both are in the top ten list of America's richest individu als. "The Kochs quintupled their combined net worth in recent years, from $10B in 2005 to $50B in 2011, now making them the third wealthiest in the world after Carlos Slim and Bill Gates. 'Koch Cash' has since become the single biggest source of funding to fight collective bargaining, clean air, voters’ rights, and strong social safety nets, in almost all regulatory arenas."